Living in Las Vegas we have to be very careful of heat conditions and our pets. We would like to help your pets by giving you some great tips. The following photograph contains what can happen to your pets paws from walking on the hot ground. Try walking your dog while you are barefoot… if the asphalt is too hot for you to walk barefoot then it is too hot for your pets paws. The damage will not only be very painful to your pet but they will have to visit animal hospital for treatment. You usually will have to take your pet every three days to have their bandages changed and this could go on for about a month. Animals need their limbs to walk. Humans can use crutches if we get hurt but pets need their legs to get around. It is extremely painful to walk on burnt paws. This can also cost your family a lot of money that could have gone to fun things for your pets. Cool Coats, Frozen Yoghund, Doggles, Cool-it Bandanas, Aussie Boots, Frosty Bowlz, & Kong Freeze Trays. You can also check out the other great Pet Friendly Businesses that help our local animal rescue groups. Pets can get dehydrated quickly, so give them plenty of fresh, clean water when it’s hot outdoors. Make sure your pets have a shady place to get out of the sun, be careful to notover-exercise them, and keep them indoors when it’s extremely hot. 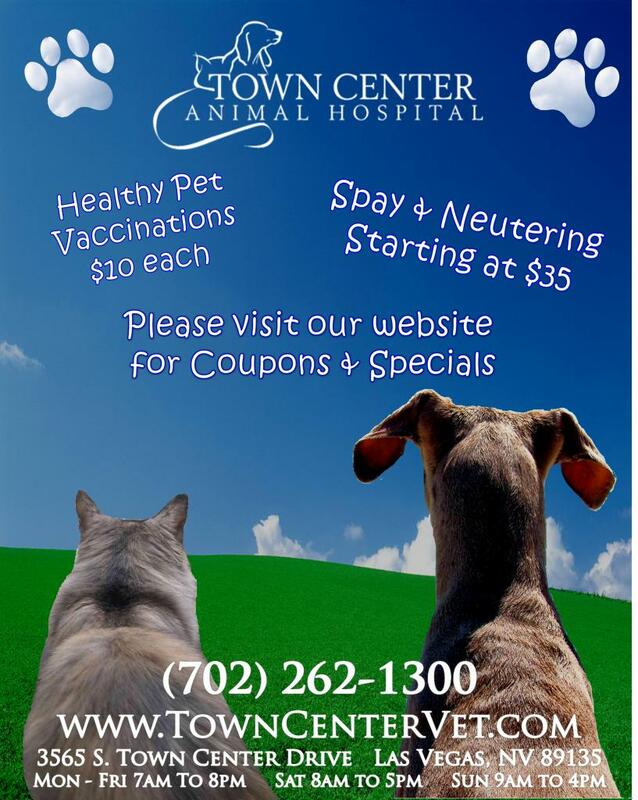 For more information about caring for your pet family please visit the http://www.TownCenterVet.com website. or Visit our Pet First Aid section. Please also remember to be careful what to feed your pets. Visit our Pet Diet & Health Information section. Las Vegas has some great Dog Parks that you can visit. Click on your city of choice to see their dog parks.